AIIMS MBBS will be conducted for admission to MBBS seats offered by 9 AIIMS institutes. Aspirants who wish to appear for online entrance exam must fill the application form of AIIMS MBBS 2019, which will be available from February 21, 2019 onwards. Last date to fill AIIMS MBBS application form is March 12, 2019. The registration and form filling will be conducted via online mode only. To apply for AIIMS MBBS, a candidate must have passed Class XII from a recognized University/ Board of any Indian State with Physics, Chemistry, and Biology as subjects and an aggregate of 60% aggregate marks. AIIMS 2019 is a National level MBBS Entrance Exam conducted by All India Institute of Medical Sciences for admission to MBBS courses. 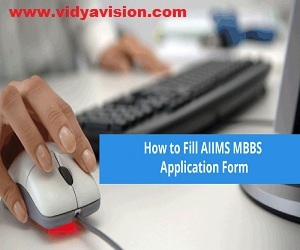 How to fill AIIMS MBBS 2019 Application Form? The process of registration includes two stages which an applicant must complete to proceed further to fill the application form. In order to register for AIIMS MBBS 2019, candidates can use the link provided on this page. Using the link, an instructions page will be displayed on the screen containing a short procedure to fill AIIMS MBBS application form. Candidates must go through the instructions thoroughly and click on ‘proceed’ to move further. Thereafter, the system will generate new registration form, in which all the following details must be filled. Personal details: Name, father’s name, birth date, category, nationality, ID proof details. Preferences of AIIMS: Candidates must select 7 AIIMS institutes as per their preferences. Contact details: Valid email ID and mobile number. Aspirants will be directed to pay the prescribed application fee page. Last year, general and OBC category applicants have paid Rs. 1500 & Rs. 1200 while SC/ST candidates were required to pay Rs. 800. The required application fee was paid online through credit/debit cards and net banking. Whereas, Orthopedic Physically Handicapped (OPH) candidates were exempted from payment of application fees. The third stage of AIIMS MBBS application form is choosing the exam city for taking the entrance examination. Applicants have to provide three preferences of exam cities as per their convenience. Of these, the authority will allot one AIIMS MBBS exam centre in the preferred city. The entrance test is expected to be conducted in around 171 cities of India. The allotment of AIIMS MBBS exam centres will be done on first come first serve basis. Thereafter, aspirants have to fill their qualification and address details in the application form of AIIMS MBBS. Candidates must provide the following academic as well as permanent and correspondence address details. In this step, students have to upload their recent passport size photograph, signature and left thumb impression as per the specifications mentioned below. It must be noted that images once uploaded cannot be changed. Thus, applicants are advised to be careful while uploading the images. This is the most important step of application process. After completion of all stages, aspirants must click on ‘final submit’ button. Candidates will receive an acknowledge mail from AIIMS after final submission. A print out of application form must be taken by the students. It is advised to verify all the details in the application form before taking a print out. The submitted application form contains personal information, payment details, choice of cities, qualification and address details, uploaded images. If in case, candidates have made some mistake in AIIMS MBBS application form, they will be allowed to edit the details. The facility of correction window will be made available from March 2019. Applicants will be allowed to make changes in the application form except the choice of exam centre. After the last date of correction window, no rectification can be done. The link of correction window will be provided on this page as soon as it will be activated by AIIMS, New Delhi.